Algae growing in Bath’s Roman Baths could one day be used to make fuel for our cars. 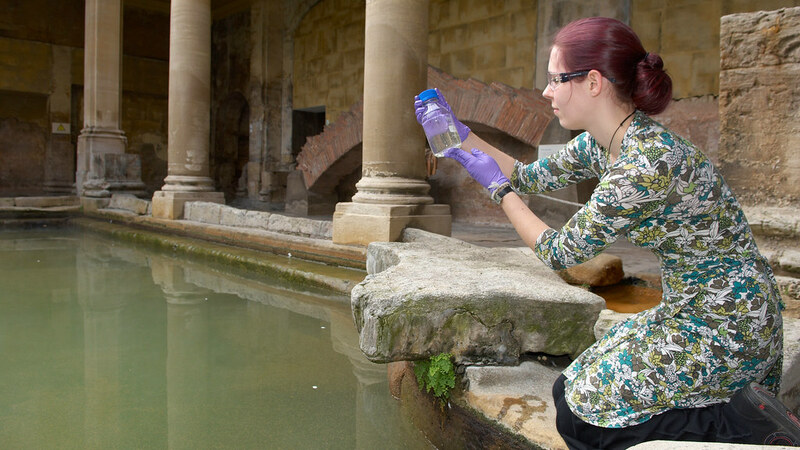 PhD researcher Holly Smith-Baedorf collecting algae samples from the Roman Baths. The Roman Baths are currently at the centre of a Department of Biology & Biochemistry study aimed at producing renewable biofuels from algae. The race is on for a renewable liquid fuel as oil prices skyrocket and global resources deplete rapidly. Biodiesel can be produced by extracting the oil from the algae cell, with certain types of algae having a higher oil content. Researchers from the University are looking for ways to make the production of biodiesel from algae commercially viable. Studying the unique algae growing in the high temperature waters of the baths might make the wide-scale production of biofuels a real possibility for future transportation energy. Research has been carried out into creating biodiesel from algae over the past 20 years; however limitations currently prevent the technology being used on a large scale. PhD student Holly Smith-Baedorf is working on the research project. She explains: “Algae are usually happiest growing at temperatures around 25 degrees celsius and that can limit the places in which it can be cultivated on a large scale. “Areas where these ideal conditions are available also usually make good arable areas and are therefore needed for food production. But the algae growing in the hot water of the Roman Baths is perfect for the research. Algae cells are very versatile and can change many of their characteristics in response to their environment. The protected environment in the baths gives an ideal environment in which adaptation can take place. There are two different baths, and both maintain a steady temperature. The King’s Bath is 46 degrees celsius and the Great Bath is 39 degrees celsius; both have remained constant for many years. The temperature of the Roman Baths is created by rain falling in the Mendip Hills, and running down through limestone at 10,000 – 14,000 feet below ground where thermal temperatures can reach nearly 100 degrees celsius. Pressure builds up and pushes the water up through faults in the limestone, surfacing at approximately 250,000 gallons a day in the Roman Baths. Holly said: “We have identified seven different types of algae in the baths. There are many more but they are in such low cell densities that we have difficulty isolating them, for now”. The research team, which also includes collaborators from the Department of Chemistry, led by Professor Matt Davidson, and scientists at the University of the West of England, headed by Dr Heather Macdonald, is growing each of the seven types of algae from the Roman Baths over a range of temperatures and comparing them to ‘control’ algae known for being good for producing biodiesel at normal temperatures. However, while the ability to grow at high temperatures is one limitation on large-scale biodiesel production, it is not the only restraint. Algae cell walls are particularly difficult to break making extraction of the oil inside an energy intensive process. Some algae cells are also easier to filter than others, greatly reducing the energy and economic cost of ‘harvesting’ the algae from cultures. The research team are therefore also looking for a species of algae with a weaker cell wall, high oil content and the possibility to use cheap filtration techniques, keeping production costs low. Professor Scott said: “There are a lot of variables that need to be right in order for the wide-scale production of biodiesel from algae to be viable, which is why it is important for us to classify and test as many species from the Roman Baths as possible. The research team is now carrying out tests on the species of algae identified to determine which most suits potential future mass growth for biodiesel production.